The village area is along the rim between Yaki Point and the Bright Angel Trail -- or between the trail down and the trail up. This is where the crowds are. You occasionally get views of the river, but do not get a true sense of how far down it really is (until you actually walk it). Glen Canyon Dam captures much of the red silt so that the river is usually green, but after heavy rains in eastern Arizona the river is visibly red. 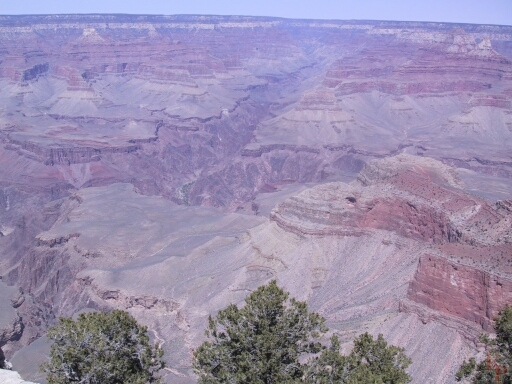 One feature visible from this area is Plateau Point -- the destination of one of the mule trips. This is beyond the campground at Indian Gardens on the Bright Angel Trail which is the last water before the bottom (or the first water on the way up). 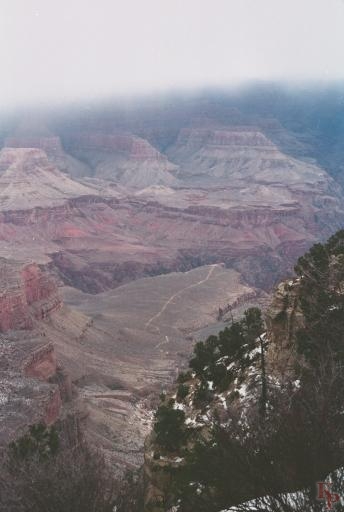 The transfer station for the Hermits Rest (Red) shuttle is near the top of the Bright Angel Trail. From Yavapai Point you get some hints of the river, and the green around Phantom Ranch, but the Colorado River is not seen from most of the view points. Yavapai is served by the same shuttle as Yaki Point with connections at the Visitor Center. Mather Point. This is the first viewpoint when you enter the park from the usual route from Flagstaff and Williams. Everyone stops here. The parking lot is often full. The parking is now connected to the information plaza, which was originally designed to be the terminus of the (rail) shuttle from the hotels near the park entrance in Tusayan (Purple Shuttle). The new facilities include added parking and the elimination of the parking at Mather Point itself. The Purple Shuttle operates to the hotels beyond the park entrance, but too many people still just drive in for the day and hunt for parking. Unless you are spending the night, try to avoid driving in and just take the shuttles inside the park (you can't park at the best view points though there are people who ignore signs and block the shuttles from stopping). Come in the winter for different views of the same location. 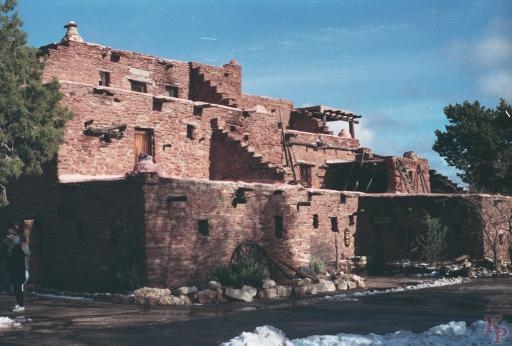 Like the Watchtower, Hopi House dates from the early 20th century and was designed by Mary Colter for the Fred Harvey Company to look like an Indian pueblo. It has low ceilings and now houses the usual gift shop (carries more native American products than cheap tourist trinkets). 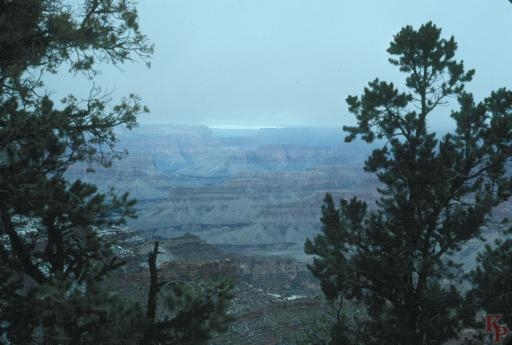 If you can stay in one of the rim lodges (Thunderbird, Kachina, Bright Angel), you can get these views without walking. Not all the rooms have a canyon view, you may need some luck or an early reservation. The El Tovar has fewer views, it is designed to be looked at, not looked from.